Conformal carriage of AAMs is what I am talking about and the best Soviet/Russian example to date is the belly position on the Mig-31 for its AAMs. The R-33 and R-37 are very similar to the R-77 in the sense that they all have pneumatic arms built into the launch positions that actually throw the missile down and clear of the aircraft before the missiles rocket engine ignites and takes the missile away towards the target. well in my terms it would be called as "semi recessed" placement . i understand .However notice that the MiG-31's fuselage where the R-33 is mounted is shaped similar to R-33's body allowing the R-33's to "sink down" to the MiG's body . This indicates that it was designed from the very beginning to acommodate R-33 as main weapons. "sink down" to the MiG's body . It certainly was designed for R-33 missiles, but the R-37 missile were designed to be carried exactly the same way and would also fit. Both are designed to be belly mounted, while the R-77 is designed to be carried internally so all three are designed with ram arms to throw them down and clear of the launch aircraft to ensure a safe separation when fired. That is because you are showing the rear set of missiles... the front set of R-37s sink in just like the R-33s... the rear set of missiles don't need to sink in because they have missiles in front of them disturbing the air flow so sinking them in at the nose will not further reduce drag. 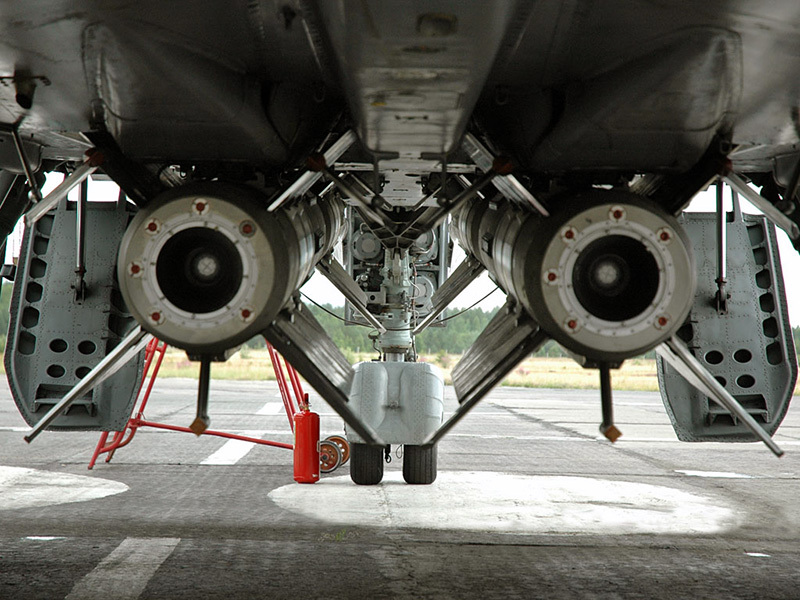 The disturbed airflow from the missiles in front of them actually make the rear missiles low drag already. OK, the top photo shows the rear end of the front R-33 missiles mounted but as you can see how they are angled nose up with their rear ends hanging down there would be no huge advantage to fairing in the noses of the rear missiles into the fuselage because the air travelling over the missiles in front is already clearly disturbed so the rear missiles don't add very much extra turbulence and that means they don't add much extra drag... which is why you position them behind the front missiles... like cyclists slipstream cyclists in front of them so they don't have to work so hard pedalling into the wind. Okay.. aside from Drag related issues.. well i'm still "playing safe" in here.. since i haven't yet tried to calculate drag contributed by stores . hmm a new Missile, well it's different to RVV-AE-PD.. since it uses Gelled Propellant , enabling restart of the engine for increased persistence against evading target . 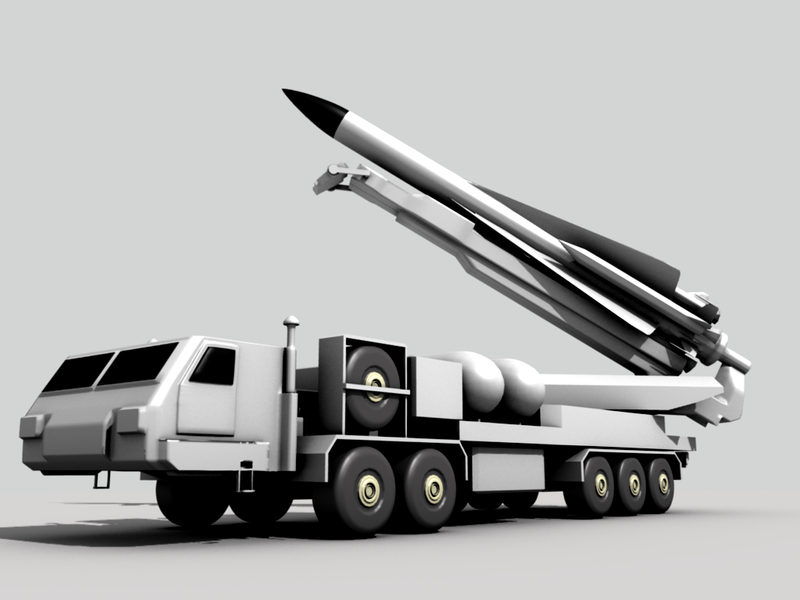 By the look of it it will be larger than the R-77. For your small fighter I would think a more compact and smaller design would be better... like an R-73 with an R-77 seeker with a range of 30-35km or so would be small enough to be carried conformally on the belly of the little fighter in reasonable numbers. There would be no size limitations for a wing tip position so a standard or long R-77 model could be fitted to the wingtip leaving 4 pylons free under both wings for other things like external fuel tanks or air to ground ordinance... meaning that even when carrying two fuel tanks and two guided bombs you can have 2 BVR missiles on the wingtips and perhaps 4 WVR missiles... say two with IR seekers and two with ARH seekers, plus a cannon... it would be a potent little plane. For medium range interception replace the bomb with longer range AAMs and for general patrol duties it could have all AAMs. The best idea for long-range dog fighter missiles that I've seen so far is an unnamed variant of the R-74 that features a R-27 "back body' that acts as a booster, like on various space lift vehicles, and then releases a short range missile to do high-g maneuvers close in. Perhaps your missile should do something like that instead of being a single unitary round. I quite agree ISS... a two stage missile is a good idea for an AAM because an AAM needs good flight performance so a good power to weight ratio is good for manouver capability. 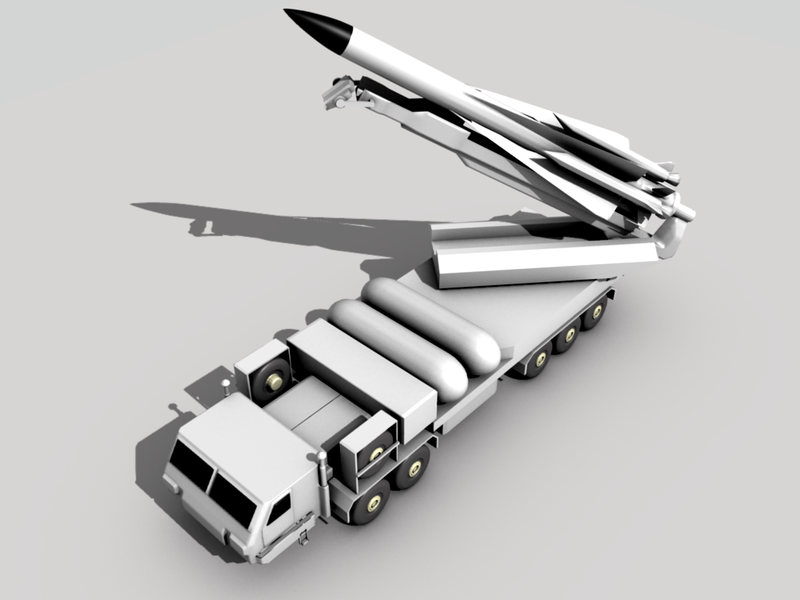 By dropping its booster stage you are left with a small light missile that should be able to manouver quite well to hit a capable target like a fighter. Of course the question suddenly becomes the choice of booster... most long range missiles will climb and fly a ballistic path to the target because they can move faster and further in the thinner high altitude air and then they can get energy and speed back in their dive back down onto the target. Using a solid fuel booster is commonly used in SAMs for long range and would be a good choice because they are fast and reliable and relatively safe to handle. As ISS suggests one of the many R-27E missiles can have their seekers and warheads removed and missiles fitted to the nose... the R-27E was designed to be modular and have a range of seekers and warheads fitted anyway would be cheap and simple and effective and mostly already paid for. 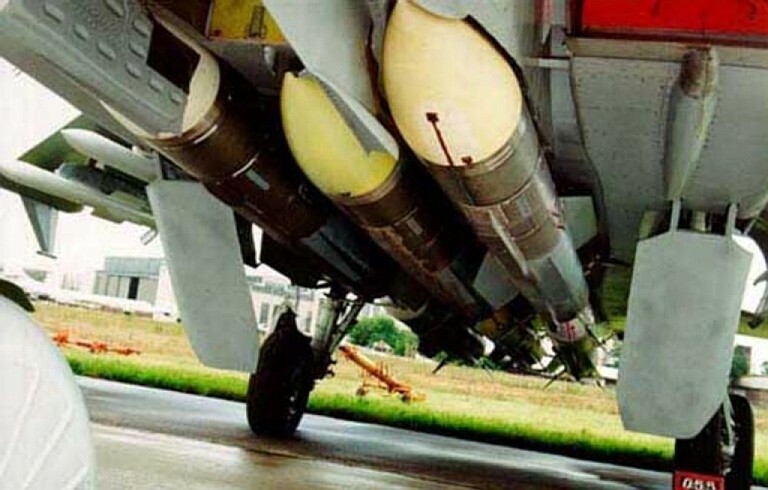 This sort of modification could also be used for other weapons... the Serbs during the Kosovo conflict attached IR guided missiles to booster rockets too, but I have not read of any actual use of such systems. Sure desperation stuff, but also a good way of using up large stocks of obsolete missiles. 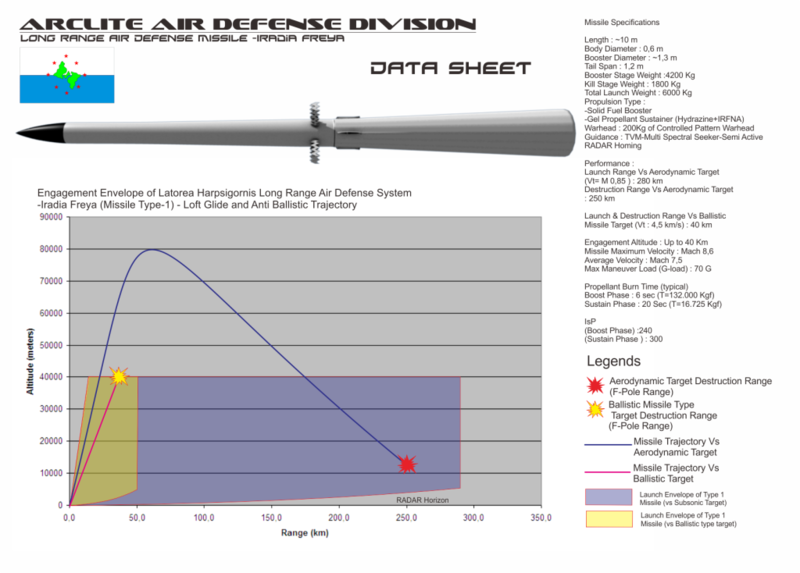 IronsightSniper wrote: The best idea for long-range dog fighter missiles that I've seen so far is an unnamed variant of the R-74 that features a R-27 "back body' that acts as a booster, like on various space lift vehicles, and then releases a short range missile to do high-g maneuvers close in. Perhaps your missile should do something like that instead of being a single unitary round. I did consider such as option .. hmm however i see Ramjets are much more suitable for solution , mainly due to High IsP offered by its power (some 500-700 or perhaps more depending on operational profile) which would mean the missile can still be "powered" for end game. The high G maneuver can still be achieved through that Grid fins and TVC Jet vanes . 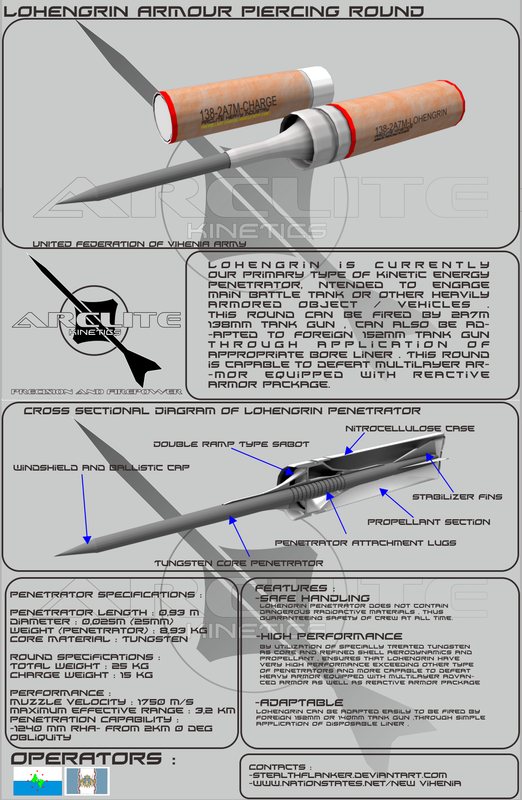 and This thing... an APFSDS penetrator i called "Lohengrin"
The only real fault of Ramjet/Scramjet engines is that like any jet engine they can stall in some extreme manouvers/parts of their flight envelope. There are really two parts of missiles flight... the initial cruise to the target area.. usually control by inertial navigation or INS (Inertial Navigation System)... basically an autopilot that delivers the missile to a point in space where it should be able to detect the target with its own radar/IR seeker. And the other part is the terminal phase where the missile does the final fine manouvering to actually hit the target. Previously a pure rocket powered missile burnt its fuel and accelerated to flight speed rapidly... up to 10 seconds or so and then coasted the rest of the way to the target. The further away the target was the less energy/speed the missile had when it arrived. Some missiles used a lofted flight trajectory so they flew further in the thinner higher air and could increase speed in the terminal phase by diving down on the target and using gravity to assist in adding energy/speed. The R-27E is one missile that uses a lofted trajectory to maximise range. A Ramjet or Scramjet has the advantage of any jet engine in that you can fly it in an optimal trajectory... you burn extra fuel climbing, but the reduced drag means it flys faster and further and much of the energy lost in the climb can be recovered in the dive on target... so high throttle to climb... low throttle to cruise to the target area and then high throttle again for the terminal phase for maximum terminal energy. A Rocket can't do that exactly, but it can mimic it. An R-73 with an ARH seeker fitted attached to an R-27E rocket motor could be fired in the direction of the target and climb and fly with the energy of the booster rocket. When it burns out it is dumped to reduce drag and weight and the remaining R-73 missile can fly to the target area on momentum. When it gets to the target area it dives and fires its rocket motor... which has thrust vector capability which allows it to make extreme turns while it is burning so it should be very lethal in the terminal phase. Both solutions have advantages and issues, and it would make sense to actually build both. The two stage version is cheap because the booster and final stage components are already in production... all it needs is a datalink back to the launch aircraft for data updates if the target changes heading or speed while the missile is on the way. The Ramjet/Scramjet option is more expensive, but offers potentially enormous speeds and very long range. 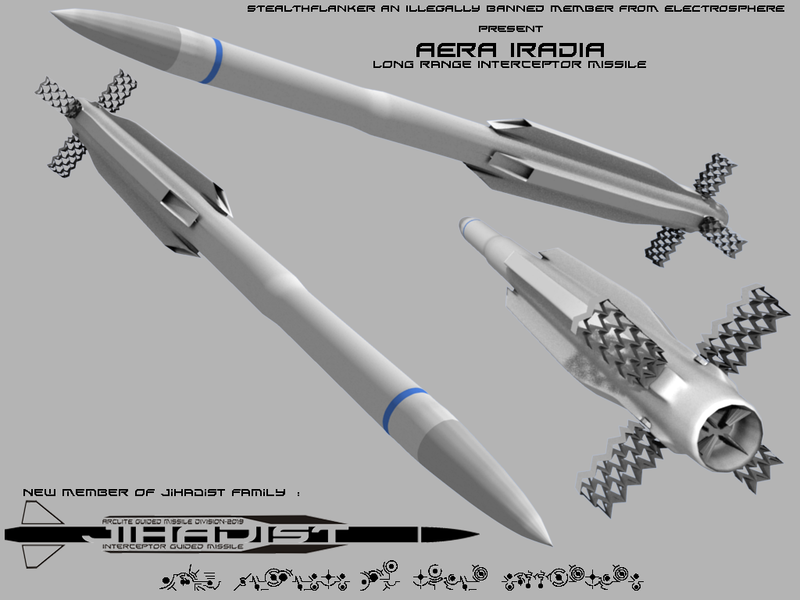 Most of the missile including AAMs are made air to surface just by adding more solid dart in tandem..SLAMRAAM for instance. In solid propulsion the darts are filled with specially configured shapes what we chemical engineering. call them GRAIN CONFIGURATION. so you see that when you go for different profiles in a single dart the geometry of grain becomes difficult so instead of achieving various profiles in a single dart you go for multiple darts there are easy to manufacture at mass scale with less precise geometery controls..
For those of us that are not engineers what the piece nightcrawler has posted is talking about modifying the solid fuel to change how it burns. It omits that different energy solid fuel can also be used as well. Old rockets used to use solidly packed rocket fuel that burns from the bottom to the top like a sky rocket burns black powder. The problem with this design in a rather more powerful rocket is that the walls of the rocket needs to be able to withstand very high pressures and high temperatures. A solution to that was to make the solid fuel truly solid rather than just a powder and then drill a hole right up the centre. This means when the rocket ignites rather than the surface of the base of the solid rocket fuel burning and pushing against the walls of the rocket the entire core of the rocket fuel burns... generating more surface area and more pressure but it is pushing out against the remaining fuel which supports the pressure and absorbs the heat so the rocket motor walls can be made thinner and less strong... in other words lighter. 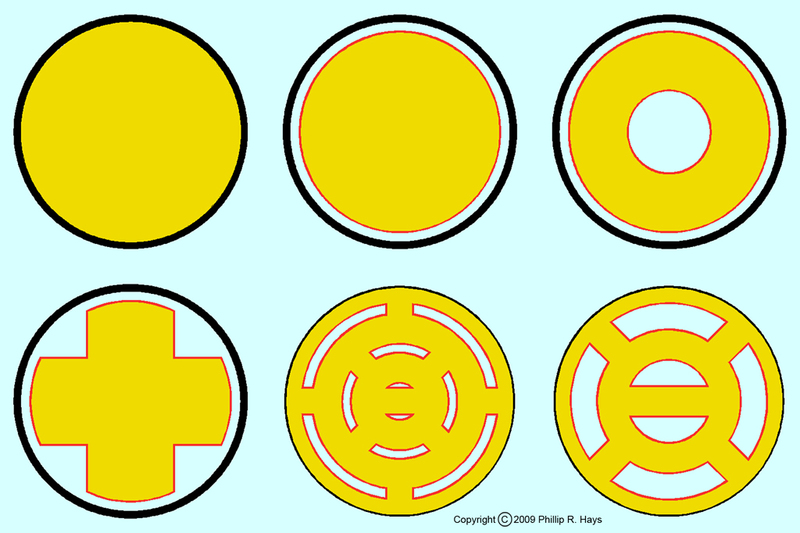 To increase thrust further instead of drilling a circle you can drill a star shape which increases surface area and therefore burning area further increasing thrust with the same fuel. Obviously there is no free ride... drilling the core and using star shaped core design to maximise surface area also dramatically reduces burn time because the fuel burns faster. The pressure is however much higher and would get a missile to a higher peak speed. Most solid fuels are actually baked like a cake and as with most cake recipes what they often do is use different energy fuels so the first inner layer that burns first is a high energy fast burning fuel, while the second layer burns slower but much much longer. This means that when you launch a missile the first layer burns rapidly and accelerates the missile up to its max speed. When that burns up the next layer burns and it is not powerful enough to keep accelerating the missile but it burns for much longer than the first layer and helps the missile overcome drag and maintain velocity and energy till it reaches the target. In many ways the second fuel acts like a gas generator to overcome drag like base bleed ammo extends the range of artillery shells. Anyway what I originally wanted to say is that you can shape the thrust of a solid rocket motor with different fuel types and different fuel shapes, but at the end of the day this is fixed for a solid fuelled rocket. A solid fuelled rocket like a Phoenix might be optimised to be fired from medium to high altitude at a very long range target but any profile expected for the missile will disadvantage the missile if it is used outside of that expected flight envelope. For instance the missile is designed to be fired from medium to high altitude and cruise for a period and then dive on the target... If launched at low level at a target that is outside Sparrow range but not by much then the missile will enter its terminal manouver flight stage with a lot of cruise fuel left... so it is over weight, and is generating enough thrust to overcome drag and the initial high energy fuel was not enough to allow it to climb to more than medium altitude so it is flying in much thicker air than was anticipated so it is flying slower on its way too. Another problem with rocket fuel is that it is either on or off and when it is on you might find that a lot of energy is being wasted. What I mean by that is that at very low level there are not many objects that can exceed Mach 2 no matter how powerful their rocket motors are. If you launch a Mach 4 AMRAAM at low altitude... it will not be a Mach 4 AMRAAM... it will be a Mach 2 AMRAAM, which greatly reduces its maximum range. The thing is that they both have the same rocket motor and are expending the same amount of energy... the problem is that trying to fly at mach 4 at low altitude is a waste of energy. A Meteor is a mach 4 or 5 missile and with an engine throttle if launched at low level it will use a reduced throttle and will likely fly at mach 1.5-2 depending on the design and how efficient it is. It wont however be running its engine at full power and full fuel burn and so it should be able to fly rather further than a similar rocket powered missile. The reason is that an onboard computer can optimise the thrust and fuel burn rate to get the most efficient use of fuel. I know this well thanks.. playing with grain shape.. unfortunately it's "modulation potential" is limited , other way is to put a "pintle" in the nozzle or retractable silver wire in the grain . The graph is bit misleading... the missile is actually lying 317km from that 80 km Apogee..instead of depicted 250 km . 280 Km is the Launch range for Sub sonic target with Vt= Mach 0,85 at 12.000 m ..the 250 km is the "F-pole range" it is a distance between launcher and target where target is expected to be destroyed. so i can finally "prove" and "test" my design rules to achieve low RCS . other way is to put a "pintle" in the nozzle or retractable silver wire in the grain . Well about "Pintle" it's basically a control valve, used to control burn rate by modifying the combustion chamber pressure, the pintle consist of aperture , the valve itself and actuating mechanism . If high propellant burn rate is desired, the valve will "close" , this will increase chamber pressure and later resulted with higher burn rate of the propellant , and contributing to higher thrust . 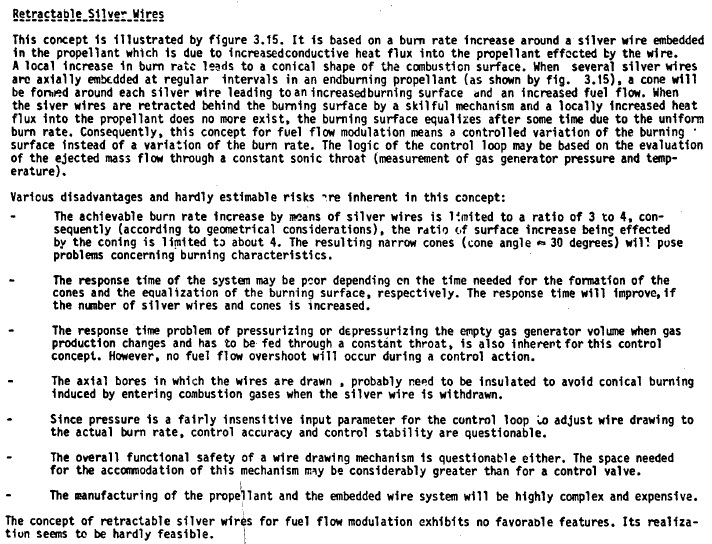 In the other hand if lower burn rate is desired , the valve will "open" , resulting with lower chamber pressure and lower burn rate of the propellant , therefore resulted with lower thrust . 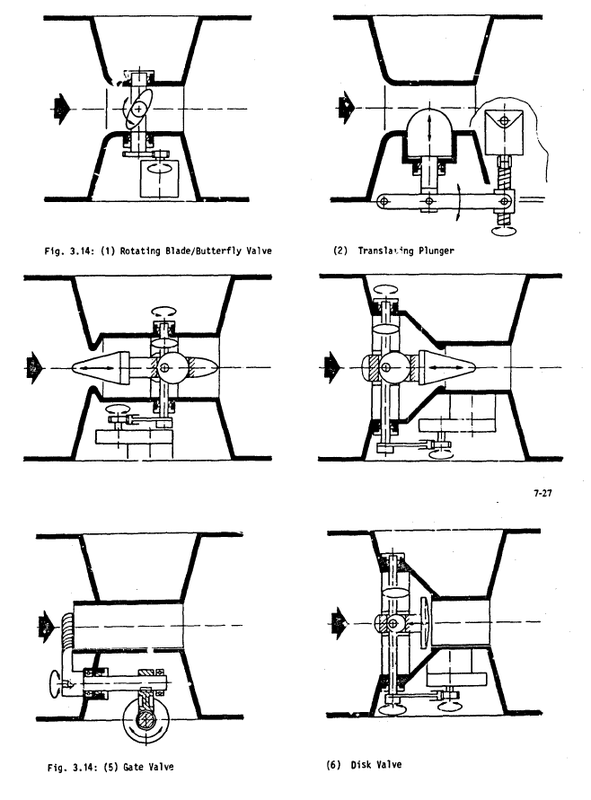 The kinds of Pintle , from my AGARD research paper collection, well they're used to control fuel flow in solid rocket ramjet/ducted rocket powered missiles like MBDA Meteor, however their principles are pretty much the same . 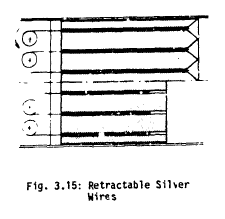 As for the Silver wires , here is a passage from "Solid Fuel Ram Rockets"
hmm the TEL is well pretty much my own stuff..it can perform re-fueling and de-fueling operation of the mounted 5V28 missile . This is the new engagement RADAR to replace our old .. 5N62 "square pair".. well it's completely my imagination.. again BUT i think it's the most capable solution for reducing cost.. using Reflective phased array like the 64N6 "Big Bird"
I call this thing as "Cheerubia"
Alternatively of course purchasing S-300PMU-2 would be good options since it can control S-200.. however since potential client for this scheme are being Embargoed by US and friends (except Syria maybe ?) ..my "mobile" S-200 above.. should be useful.. not against fighter jets or cruise missile.. but to kill AWACS, JSTARS , the noise making MC-130 Compass Call ... or any other aircraft having "E" initial before numbers. From a design standpoint I find this thing to be ridiculously awesome. I want one! The only thing you're missing are some pretty solid deployable struts to brace the TEL for firing. 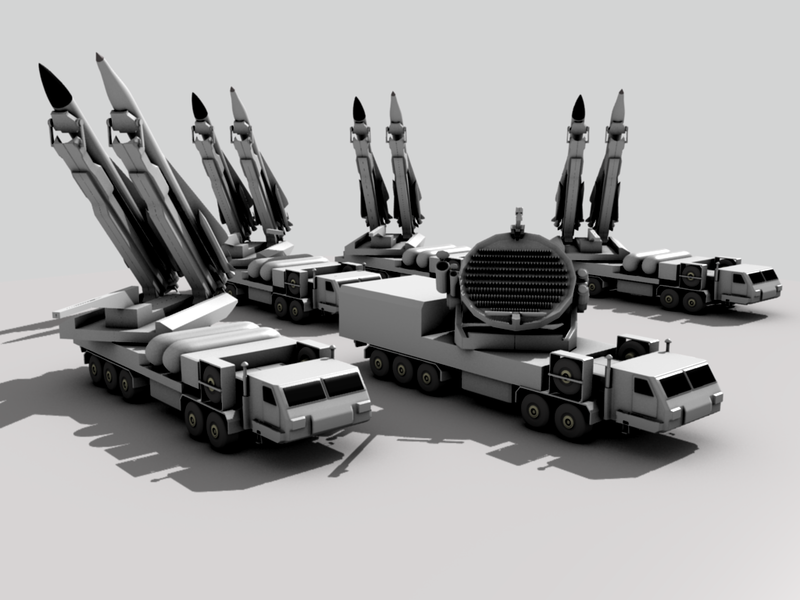 S-300P series TELs use puny little ones because there isn't much force exerted by the cold-launched missile ejection, but this thing will be another story entirely. I do find the radar vehicle and the array design to be pretty interesting as well. From a practical standpoint, an export nation is better off acquiring the S-300PMU-2 or waiting for the S-400. They're far more modern missiles, and can engage pretty much whatever endoatmospheric target they want as they retain far more maneuvering capability over their envelope than the S-200. You loose a little bit of range with the PMU-2, but it's worth the tradeoff. Besides, the large TELs and the all-new radar would make for an expensive upgrade, probably to the point where the other systems aren't much more expensive anyway. And then you also have to upgrade the missiles; if you do all of this work and then retain the archaic SARH seekers, you haven't really made the system any more effective. If you don't change the seekers, existing ECM systems will likely be able to defeat the new model, provided they could handle the non-mobile S-200. SOC wrote: From a design standpoint I find this thing to be ridiculously awesome. I want one! The only thing you're missing are some pretty solid deployable struts to brace the TEL for firing. S-300P series TELs use puny little ones because there isn't much force exerted by the cold-launched missile ejection, but this thing will be another story entirely. 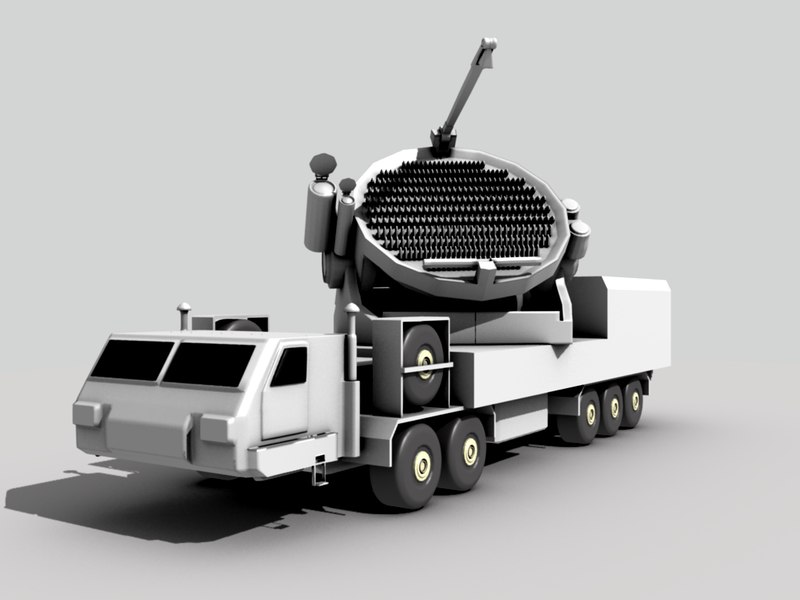 I do find the radar vehicle and the array design to be pretty interesting as well. Hehehe thanks , yeah i haven't put any strut XD. As for the RADAR, well i see circular array.. with Big Bird style reflective phased array , would be cheaper and easier to manufacture , and will surely exceed those 5N62 RADAR.. in terms of resistance toward jammer and may offer some basic "LPI" capability in shape of agile beam steering , and it can provide multiple target engagement capability, no differs than MiG-31's Zaslon or the 5N63 phased array. In the down side.. this arrangement may have lower receiver and sidelobe performance , because of the antenna feed which act as a "aperture blockage" and this scheme may have higher loss . Oh and this is the "Wilder" version of my Mobile S-200 i call this thing Edea , the missile has new seeker .. and there's another missile with passive anti radiation seekers, with IR backup . Might not really practical.. but well i love this words "Double the gun double the fun"
Agree .. but none the less.. at least for "national pride" side being able to "mobilize" the fixed S-200 and giving it better capability would provide some deterrence . OK, from an aesthetic viewpoint, the twin-rail TEL is awesome. Not sure how the balancing would work firing off one of those, but it looks cool as hell. Have you modeled anything in-service in 3D? SOC wrote: OK, from an aesthetic viewpoint, the twin-rail TEL is awesome. Not sure how the balancing would work firing off one of those, but it looks cool as hell. Have you modeled anything in-service in 3D? Hmm well so far i'm only make the missiles used by the systems, like the 5V21/28 family for S-200, 5V55 and 48N6 for S-300 family and 9M82 and 9M83 ..
Well it's beeen a while since my very last visit here..
hmm let's have a drawing session. These jets aren't for fighting..but more like aerobatic purpose. Their configuration and weight is set for maximum aerobatic performance and extreme controlability, provided by delta canard configuration and 3D TVC. Potential customers for these beauties are rich people, aerobatic teams and any other aviation enthusiasts willing to spend some U$ ~25.000.000. Shalya Meritreya, twin seat version of Emeria. Anyone into Compound Helicopter ? Something I modelled called the MAZ-365. 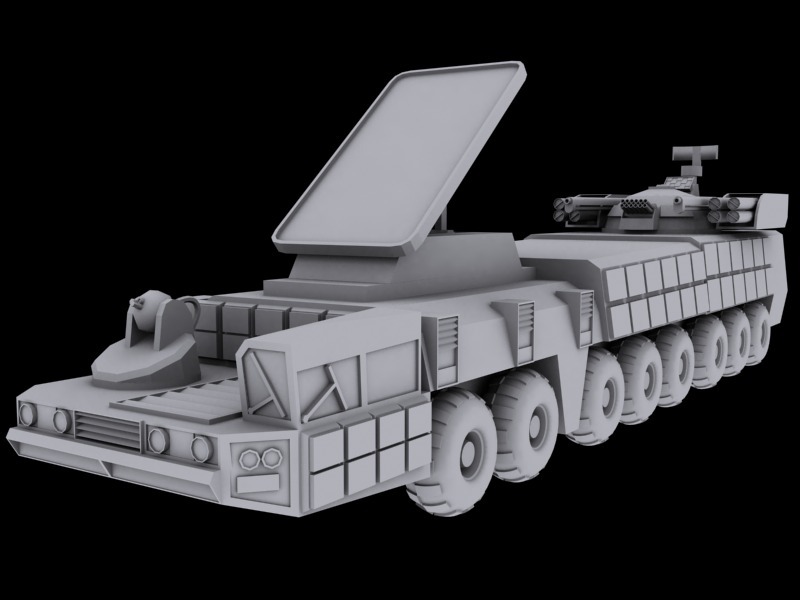 Utilising a MAZ chassis, the command vehicle of the Russian Armed Forces come equipped with an advanced radar suite, and a turret equipped with SA-19s and twin 30mm cannons, allowing the vehicle to defend itself against infantry ambushes or aerial threats.